Parents have to deal with some puh-retty crazy stuff on a daily basis, so it’s only right that they enjoy the occasional laugh… at the expense of their kids. 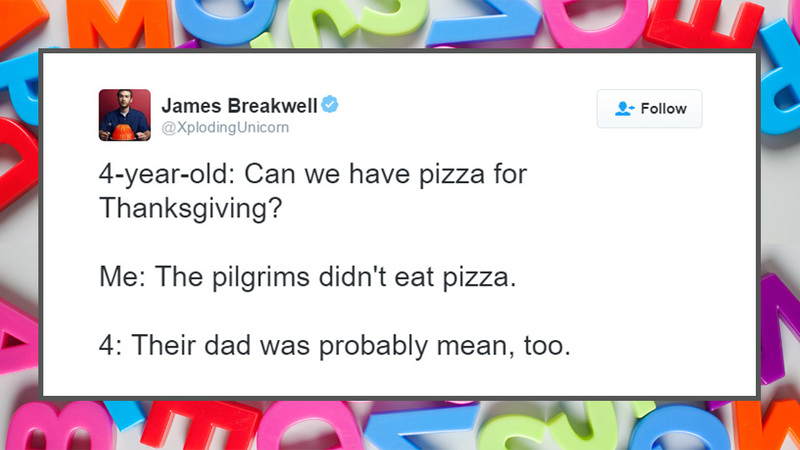 Here are 10 tweets from parents this week guaranteed to make you LOL. 7yo daughter: Can we get a dog? 7yo daughter: I'll make myself blind to get a service dog. 2. So there is such a thing? Just saw a man wearing a plaid Under Armour ball cap and now I know that being "too dad" is a thing. Pretty disappointed to find out that "Toys for Tots" isn't a program where I trade my kids' toys for delicious tater tots. My 7yos could be playing with rubber bands 3 towns over and still manage to hit me in the face with it. Husbands should know better than to ask how we are when they know we've been with our children all day. DC: Which room will you be working out in? Me: None of them, I just need to take a shower. Me: Did you know kids with mean moms grow up to be strong and successful? 9: Then I'm gonna be a kajillionaire superstar. If your kids aren't singing "Hard Knock Life" did you even ask them to clean their rooms? Let's take a family vacation so I can wash clothes to pack clothes to unpack clothes to bring home dirty clothes to unpack & wash at home.